Bill Nighy, Emily Blunt and Rupert Grint. Done, sold...there’s your film. With the strength of these three performers, and with sometime help from Rupert Everett, Eileen Atkins and others, director Jonathan Lynn (Yes Minister, The Whole Nine Yards) brings us a fast and quirky British comedy which is cutely outside concrete realism just that little smidge. Not that it matters, because it’s lots of fun. Lucinda Coxon’s screenplay is based on the 1993 French comedy Cible émouvante but was obviously and understandably anglicised. Nighy plays Victor Maynard, a straight-laced 50-somethig faceless contract-killer whose reputation is impeccable. Blunt meanwhile is Rose, the carefree embodiment of charming theft and cunning. There’s a wonderful scene in a market where we get to know her: Maynard is trying to kill her. But why? Because she cheated crime-boss Ferguson (Everett) out of a painting purchase. Through numerous complications, Maynard and Rose are on the run, joined by Tony (Grint), who ends up being Maynard’s protégé. They seek asylum in Maynard’s large but sterile country estate. It’s just gorgeous and was filmed on the Isle of Man. 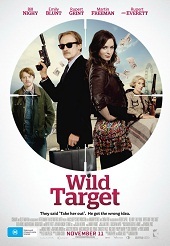 There is a lot to like in Wild Target, including clever dialogue and slapstick humour, but neither in extreme doses. Lynn handles everything with confidence and there’s even a chase involving a Mini—think Michael Caine in The Italian Job. What worked for me best was the lightness of it all. No one we care about is in real danger. It’s more of a play-along, oddly reminiscent of the tom-foolery of Mr Bean. There is also a wisp of sexuality thrown in good for good measure. Maynard ends up “confused” by Tony. The three of them, old man, young woman, young man, living in the big house, with the occasional presence of a matronly mother (Atkins), is atypically cosy. I enjoyed myself and laughter could be heard in generous amounts during the screening. Wild Target is not profound and it’s not gripping or uproarious but it’s a solid little performer. Blunt and Grint would be glad to have ditched their respective Devil Wears Prada and Harry Potter personas and enjoy more of the spotlight they play so well to. The soundtrack is good too. There’s a slight fantasist quality but it’s enjoyable enough to compel me to hunt down the French original.